Rebecca's "secret ingredient" adds a touch of luxury to this simple dairy-free beverage. Add the milk beverage, cocoa powder, coconut oil (use the full 2 teaspoons for more richness), and vanilla to a 2-quart saucepan. Whisk to combine, then whisk in your desired sweetener to taste. Place the pan over medium heat, and warm until the coconut oil melts and the liquid reaches your desired sipping temperature. Thoroughly whisk or blend with a milk frother. Divide the hot cocoa between two mugs to serve. 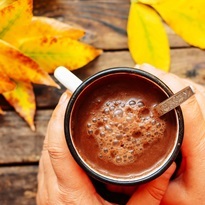 Mocha Option: Add ¼ cup fresh-brewed coffee or espresso to your hot cocoa. Or you can stir in 2 teaspoons espresso powder (like Medaglia D’Oro) or Instant coffee (like Mount Hagen Organic Cafe, also in decaf).